Don't Let Long Term Care Costs Drain Your Life Savings! What Is a Miller Trust? Miller Trusts in Texas: Will They Protect Assets From Medicaid? What Is A Miller Trust Good For? What Is A Medicaid Spend Down? How Do I Get Medicaid To Help Pay Nursing Home Costs? An insurance program paid for by the government. It is managed by each state and is for low-income people who can’t pay for healthcare. It is the primary payer for long-term nursing home care. Eligibility is means tested. I highly recommend the Michael Holland Law Firm. They have taken my hand and led me through the mound of paper work to qualify my husband for Medicaid. I am sure I would not have been able to do the job by myself. As I stated earlier in this letter I was full of doubts, stress and uncertain about the future. The members of the team treated me like family and I am very proud to recommend them to others. I feel gratitude and comfort knowing my father will be taken care of financially. I definitely recommend the Holland Law Firm. I am one of those people that requires a reference before using an individual or service and I give a strong recommendation to the entire Holland Law Firm. You took charge of the process, saw it to a successful completion and followed up and remained available. I want to thank Michael Holland, Martin and Kathy for their kindness and help no matter when we called for assistance. I can say only positive words about the Holland Elder Law Firm. A few years ago my dad was diagnosed with Alzheimer's. While touring nursing facilities, another law firm was referred to me. Unfortunately I did not perform my due diligence and opted to hire the firm to handle my case. I wish I would have found Holland then. The other firm was vague, lacked communication, and of course, overcharged. This was the polar opposite of my experience with the Holland. They were clear, concise and explained everything thoroughly to me. They always responded to my emails and typically within a couple of hours, unlike the previous firm that may not respond at all or would take several days to respond. I was not nickeled and dimed. I wish I would have found them to begin with, especially Martin. He is a rockstar and made the entire process SO easy. The whole staff at Holland Law Firm have been wonderful to work with to help get the Medicaid coverage needed for my step-dad's care. Without their help, care, and close communications I am not sure we would ever have navigated the Medicaid system! We had many unforeseen complications due to some of our family members that rattled us but never them. I'm sure they've seen everything before & they kept assuring us a positive outcome, they were sooo right!! And even after completing the case, they still called & explained what to expect from here & assured us if we had ANY questions just call. I don't know any attorneys that do that!! I am sure glad we found them & consider them a God Sent to our family. The Holland Law Firm did a wonderful job on my fathers behalf. Martin Sabel has been a godsend. If someone needs an elder care attorney, this would be the one firm I would recommend any day. The folks at Holland Elder Law are awesome. I've worked with them on a Trust account for my Mom for a year (intial set-up and annual benefits renewal). The original contact was thorough and they made it easy for me to understand. With their help the Trust account has enabled our family to enjoy each other free from the strain and worry of "what happens next." Thank you to Spencer for answering the questions on the initial call and promptly sending me the information I needed to get started. Martin Sabel is a life changer and our family is eternally grateful for his help, expertise, and ultimately, his friendship. These folks really know their stuff and care about their clients. 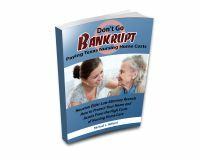 Paying for A Nursing Home: Don’t Learn These Lessons the Hard Way! Michael L. Holland is licensed to practice law by the Supreme Court of the State of Texas. He provides Medicaid, Elder Law & Probate solutions to families throughout Harris, Montgomery, Galveston, Brazoria & Fort Bend County.